Don’t give up on me just yet. 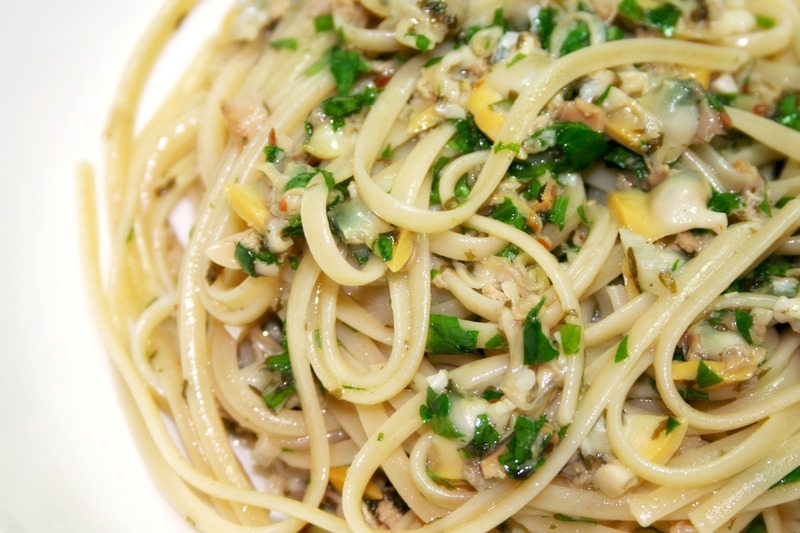 I love love love Linguine alle Vongole, or linguine with white clam sauce. I crave it and when I do, I want it ASAP. And yet, I don’t have the time or money to go clamming every time I have a hankering for some goodness. And so I have created this version over the years that is an altered version of my Dad’s recipe. The sentiment is still the same, however – you take a jar of white clam sauce, add an excessive amount of red pepper for heat and extra canned clams for awesomeness, and you serve atop boxed linguine. You can scoff, but it beats the hell out of spending $20 on the clams alone, and all of the ingredients are readily available in your pantry and fridge. No shame in my game. Because we are all walking contradictions, I do adhere to the old-school Italian custom of eschewing cheese on seafood, and not including parmasean in this dish. People do it. I’m sure my own husband, whom I love with all my heart, would douse this in locatelli when I wasn’t looking. I just don’t, and because this is my recipe, I’m the boss applesauce! Kidding, but if you are interested in an scintillating debate on the virtues/scandal that is cheese on seafood, check out this thread on ChowHound. Interestingly enough, there are many recipes out there that say “don’t ever use canned clams” and then the last step is “sprinkle with copious amounts of cheese” – WTF, I say. If you can afford the fresh clams, why would you even mask their taste with salty cheese? To which I posit, because you like it that way, just as I use canned bivalves. People in glass houses shouldn’t throw clams. This recipe is made exactly how I crave it – a semi-boring jarred white sauce is enlivened by barely cooked garlic, bright chopped parsley, and a lovely kick from toasted red pepper flakes (which you can certainly leave out if you don’t like it spicy). It tastes like homemade majesty, when in actuality, you just popped open a couple cans and did a little chopping. Best kind of recipe. Ever. In an saucepan, heat the olive oil until shimmering. Add the chili pepper and salt and cook for about 30 seconds. Toss in the garlic and swirl chili and garlic around the pan once. Immediately turn off the heat. When the water comes to a boil, add the pasta. In the last two minutes of cooking, add the white clam sauce and clams to the garlic oil. Turn heat on high and warm until sauce is a gentle simmer. It should coincide with your pasta finishing. Drain pasta and dump into a large bowl. Top with sauce and chopped parsley and toss well. Slurp away. I have made the same exact recipe and I love it !